INS Arihant serves to render robust India’s underwater deterrent. Prime Minister Narendra Modi’s tweet on Monday which read “India’s pride, nuclear submarine INS Arihant successfully completed its first deterrence patrol!" marks the first official acknowledgement by India that the country has now acquired a credible underwater deterrent. The Arihant patrol is a modest but critical first step in demonstrating the operational credibility of the submarine. However, this single achievement does not axiomatically lead to the conclusion that India’s ‘triad’ is now complete. The classical triad in nuclear deterrence is an amalgam of a complex and rigorous distillate of three different strands—the land-based missile with a nuclear warhead, a similar air-borne capability, and finally the sea-based under-water deterrent. Currently only the US and Russia among the nuclear 5 have the resources and the pedigree to claim such a capability. Even France and China have trimmed their deterrence sails. Paris, for instance, maintains only a sea-based and an air-borne deterrent capability. The classical triad is not proving to be as cost-effective as it was once perceived. India is located in a very challenging weapons of mass destruction (WMD) region, what is euphemistically referred to as “a rough neighbourhood" and the fact that both its nuclear capable neighbours (China and Pakistan) are in a deep and covert WMD cooperation framework compounds the challenge for Delhi. Add to this the fact that Pakistan has also used its nuclear capability to shield its terrorism investment and the strategic picture becomes even more muddy. Thus India’s WMD challenge is not two separate dyads insulated from each other but an overlapping one. The Arihant serves to render robust the underwater deterrent and the signalling is more relevant to the nuclear 5 about the Indian profile. 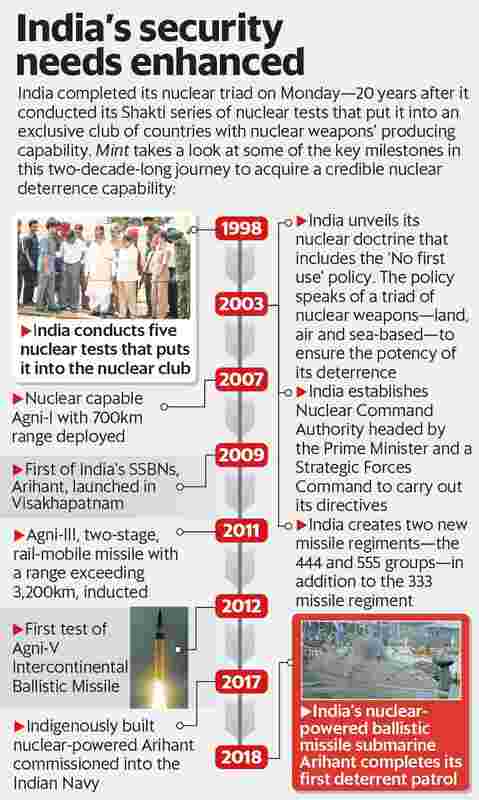 It merits recall that China, which currently has a larger WMD arsenal than India, acquired its nuclear weapon n October 1964. A decade later, Beijing test-fired its first submarine launched missile but had a series of problems in signalling its submarine deterrent patrol. This is a domain where verifiable information is scanty but it is understood that China carried out its first deterrent SSBN patrol successfully in October 2015. The missile on this boat is considered to be a sea-based variant of the Dongfeng- 4 series with a range upwards of 5,000km. In contrast, the Arihant is estimated to have a missile with a range in hundreds of kms. The differential index of relative deterrence needs little reiteration. However, the SSBN as a platform, which is what Arihant is generically, is not meant for war-fighting but to maintain, nay impose peace in an uneasy strategic environment. During the Cold War, the two adversaries—the US and the former USSR maintained these silent denizens of the deep on the “prowl" 24X7 for 365 days of the year—for decades. This prowl is the deterrent patrol that the Arihant has just completed and returned to its home port Visakhapatnam where the crew was felicitated. To place this in context and review how truly credible and robust deterrence is maintained by a medium power, France provides a cue. Paris maintains four SSBNs and the first French deterrent patrol was concluded successfully in March 1972. Over the last 46 years, France has carried out 500 such deterrent patrols and marked this milestone on October this year. During this period, French SSBNs clocked 37,240 hours underwater with the bare minimum of permissible communication. This kind of rigour ensured that the index of strategic assurance that France was seeking during the Cold War (when there was only one adversary) and in the transition to the post Cold War strategic environment, where the nature of the threat to French sovereignty is not as tangible, has been ensured. C. Uday Bhaskar is director, Society for Policy Studies.